Tags: Indian food history, Indian smoothie, Lassi. Next time you sip on a Kasa Mango Lassi delivered through a fancy on-demand technology platform, I want you to ponder that you’re also drinking in a centuries-old “offline” tradition of lassi making dating back to 1000 BC. 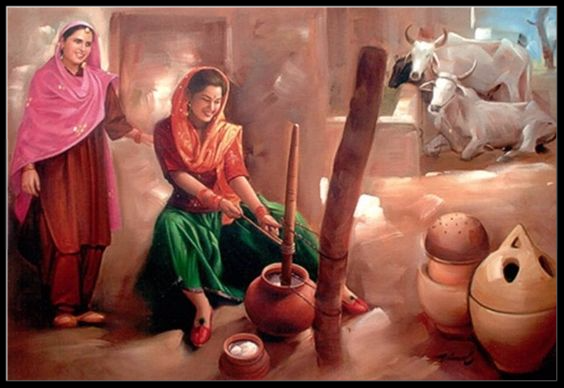 Lassi – the ‘Ancient Smoothie’ – heralds from the land of Punjab, the land of five rivers, Northern India, a lush land of a strong fiery people. Image: Chatti – an earthen pot that butter is churned in. Leftover buttermilk is used to make Lassi. There are two types of lassi – Yogurt-based and Buttermilk-based. At the foothills of those awe inspiring Himalayas, around the time the sacred texts of the Vedas were being scribed, Hinduism being born, Ayurvedic practices cultivated, poses of yoga being named….‘Lassi’ the silky creamy blend of sugar, spices, fruit, water and yogurt originated. It’s highly likely, in fact, that Lassi is the World’s First Smoothie. Necessity being the mother of all invention, it’s likely the drink emerged to cool summer’s fire. With Punjab’s mid-year temperatures soaring unrelentingly past 113F, naturally the refreshing lassi would emerge to complement India’s spicy food (which makes you sweat, which in turn cools you down..who knew!). Either way, the reality is that Lassi is a powerhouse healthy beverage, with ayurvedic properties of calming the stomach and mind, high probiotic content and stocked with calcium and protein. Kulhar – an earthen pot used to serve lassi. Fired up in the kiln, it is meant for one time use only. While I’m now a quasi expert on lassi history and making, I’m curious about trying another ‘slightly different’ type of Lassi, one with no yogurt at all but with powerful anxiety releasing powers: the Bhang Lassi! 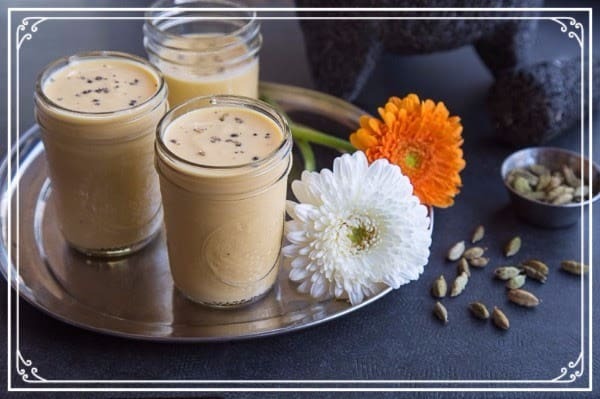 Bhang lassi is enriched with bhang derived from cannabis. Famous in India during the Holi festival. BEWARE – Ridiculously strong! There are two versions: Salted and sweet. The quality of the yogurt is very important. Purchase a yogurt with live cultures to benefit from the probiotic properties. It should be slightly sour so that when diluted with water it still retains a strong yogurt flavor. It should also have a creamy texture otherwise it will taste too watery. Put the yogurt into a jug and whisk until smooth. Add in the sugar and mix well. Pour in the water, fruit and rosewater. Continue to whisk for a few minutes until all the ingredients are well combined and the texture is smooth and creamy. Pour into a serving glass with a couple of ice cubes. Garnish with the crushed nuts and enjoy! Try the salted version. Mix roasted cumin seeds ground up, with a touch of salt and pepper to the whisked yogurt and water mixture. Serve with ice cubes and a sprig of mint.